The phenomenon of falling stars, since ever, has fascinated men. In the middle age together with the comets they were considered premonitory signs. In more recent periods they were considered able to make possible a wish; later on science has explained their true nature but this doesn't mean they have no more fascination: even under the scientific side, they have very interesting and suggestive aspects. What do they have to do meteors with VLF? Exactly we don't know it yet. What we do know in fact are EME effects in VLF and UHF; this thing is not valid for the long waves not helped by this phenomenon. Several studies show that falling stars, during their combustion emit electro-phonic signals. This theory, confirmed by some observations, shows the maximum level of these signals around 12 kHz. http://users.hunterlink.net.au/~ddcsk/ (see this interesting page). The meteoric event of 18-11-1999 has been pointed as one of the most intense passages of the last years. 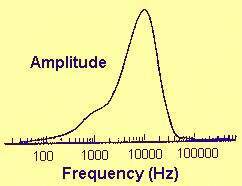 The study of the phenomenon concerning VLF has interested even NASA which equips a probe balloon with an electric field receiver (INSPIRE model: 100 Hz / 10 kHz frequency band) and sent then back to earth in real time the signals received, using UHF transmitter. 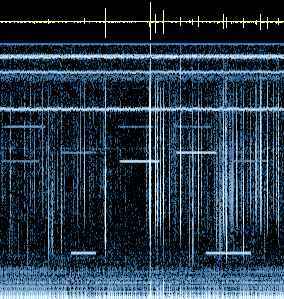 The picture show many tweaks at 1.8 kHz, and various noise below 1.4 kHz. Are also evident the negative compression effects on the quality signal. Unfortunately in all the record (about 20') are not present any kind of mark, to correlate the signal received with the meteor events. A brief selection of 2.5 seconds can be listened clicking here (104k file in .wav format): audio effect is suggestive. During the night of 18/11/99 was recorded data about the reception of vertical and horizontal electric field, received with T antenna (11m high with 45m top) and horizontal loop (3 square turn of 30m side). 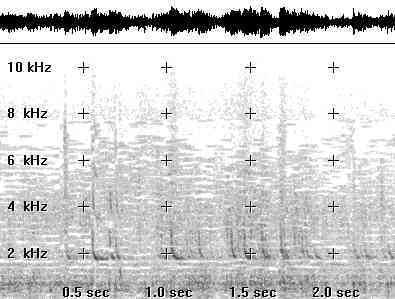 Data was recorded in .wav format (LINE input of Sound blaster card), using 44 kHz Sample rate and 8 bit resolution in stereo mode set, obtaining 46 db of dynamic range in a 1 Hz/22 kHz band for each antenna (HD occupation: about 310M each hour). To MIC input of Sound blaster card was connected a tone generator too, calibrate at 4 kHz/-20dB and controlled by external switch with a long connecting cable. Every meteor event the switch was pushed manually by external operator: IK1QFK in the courtyard at -3°C (while the cat was sleeping near the PC at +20°C in home). 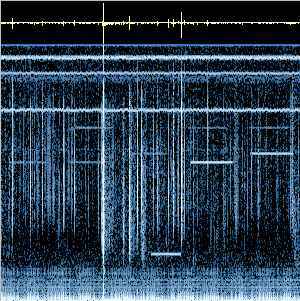 The spectrogram show 3 seconds of vertical electric field, 0-22 kHz frequency band (analyzed with Spectrogram 5.1.6, setting 30dB dynamic range and 44kHz sample rate). 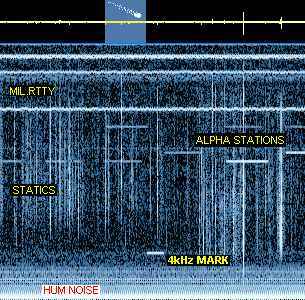 Are evident with strong signals the Military RTTY in a frequency above 16 kHz, the ALPHA radio navigation stations, the statics and the hum noise. In the middle the "4 kHz MARK" to point out the meteor event, and as indicated at the bottom of the picture the approximate time event. 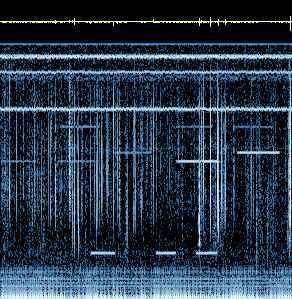 Click here to listen the 3" audio files of the spectrum analysis of the picture (133k in .wav format, 18/11/99-02:17:49). During the night was captured more than 200 episodes. The following pictures show a selection of 4 events (single and multiple). They are all reception of vertical field, because in the horizontal field prevailed the hum noise. but nothing correlated at the mark. Two meteors: the second was biggest. Nothing. Sigle event. Nothing. Single event. Nothing. And the same was for the other 196 monitored meteors. 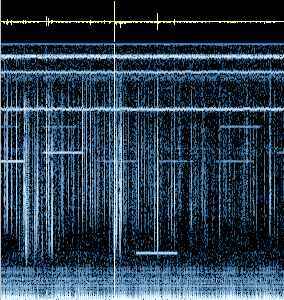 From spectrograms is not possible to put in evidence emissions of VLF signals strictly related to meteor fallings. The big dynamic of the recorded signal excludes that in band from 1 Hz to 22 kHz they have been emissions of intensity over atmospheric background noise, except frequencies under 2 kHz where prevails the hum noise. We have to considerate that no one of the 200 observed meteors offered a trail persistence over than 4 seconds. It's probable that, if VLF emissions exist associate to meteors, they are receivable in presence of big bolds only: those falling stars able to illuminate like a daylight the night sky.